Whole fried porgy is served in a traditional Jamaican-style escovitch at Ms. Lily’s in New York’s East Village. Inspired by traditional Peruvian, Jamaican and Asian dishes, or simply because they are fans of how frying locks in the juicy and intense flavors of bone-in cooking, chefs across the country are reeling in diners with whole, fried fish. “By cooking the whole fish, more flavor from the bone seeps into the flesh and the result is really tasty,” said Andre Fowles, chef de cuisine at Miss Lily’s, a Jamaican-style diner, rum bar and jerk shack with two locations in New York City and one in Dubai. Fowles took inspiration from Hellshire Beach in Jamaica, where he said local fisherman bring in daily catches from the sea and fry them on charcoal fires on the beach. In his version, the whole fried porgy is served in a traditional Jamaican-style escovitch —peppers and onions in a spicy vinegar marinade — with a side of fried sweet dough cakes called festivals. The fish is bent before cooking to give it the dramatic appearance of swimming on the plate when served. “At Hellshire Beach, the fish are always fried whole, so we maintain that integrity,” Fowles said. On the menu since last summer, Fowles said the fish has been popular among Miss Lily’s diverse guests, including West Indian expatriates and locals alike. Snapper gets a fried Thai treatment at Oyster Bah in Chicago. Inspired by Thai cuisine — one of his favorites — Pete Balodimas, executive chef of Oyster Bah in Chicago, is serving a whole, fried red snapper with Thai chile sauces. To yield a crispy but delicate crust that contrasts with the moist, flaky meat, Balodimas fries on-the-bone snapper in a blend of cornstarch and rice flour. On the menu since the restaurant opened in late 2015, the crispy snapper quickly became a signature dish. 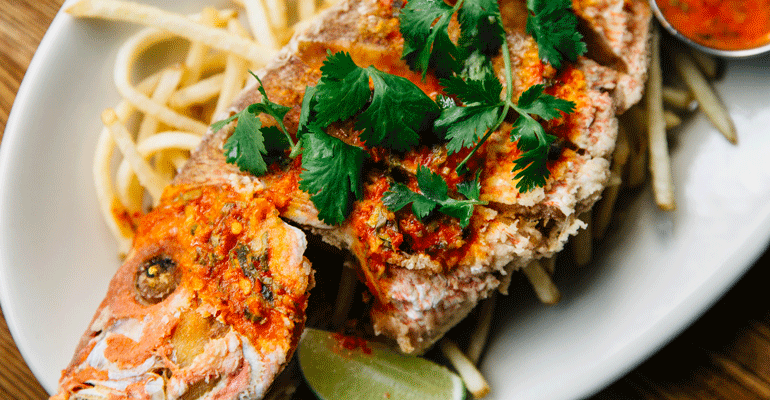 At Tanta in Chicago, a Peruvian restaurant from chef Gastón Acurio, executive chef Jesus Delgado offers a Pescado Frito that highlights the East Asian influences prevalent in Peruvian cuisine. The market-fresh fish is fried whole, and then filleted and served with the head and tail intact to create a show-stopping presentation. It’s served with sautéed bok choy, fried rice and a spicy Japanese-Peruvian “Nikkei” sauce. Lobster goes deep, as in deep fried, at LSXO in Huntington Beach, Calif.
Other chefs are giving shellfish the whole, fried treatment. 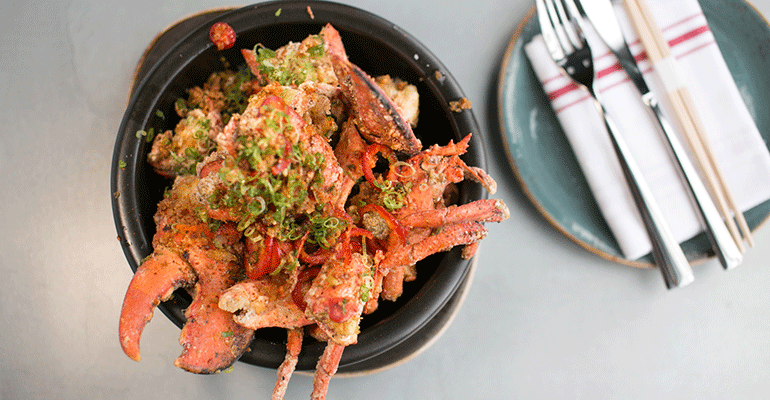 At Graffiato in Washington, D.C., chef Mike Isabella’s Italian-inspired flagship, whole, fried prawns served with broccoli rabe, Fresno chiles and shrimp aïoli are on the menu. "The whole, fried prawns we serve at Graffiato is my take on spicy fritto misto, a popular Jersey-style Italian [dish],” said chef de cuisine Elliot Drew. “I also took some inspiration from head-on, fried salt-and-pepper shrimp." Originally introduced in February as a special, Drew decided to keep the item on the menu in the small plates section as an easily shared seafood option. He said diners have responded well to it, especially when servers explain that prawn heads carry so much flavor. At LSXO in Huntington Beach, Calif., Black House Hospitality’s upscale and intimate Vietnamese restaurant hidden inside its Bluegold steakhouse and seafood grill, chef Tin Vuong is serving Salt and Pepper Lobster, a whole lobster deep fried and seasoned with butter-fried shallots, fried chiles and garlic.